The news and people of Tillamook County, Oregon. Every day. 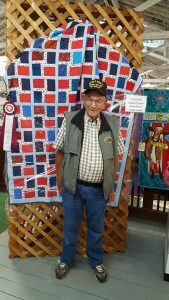 Rudy Fenk with is “Quilt of Valor” – proudly on display in the Textiles department. Marci Hallock with granddaughter Blair. 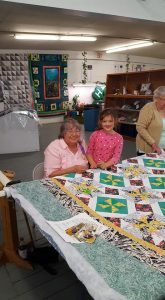 Blair has been stitching on the Fair quilt for four years. She started helping at the age of 5. 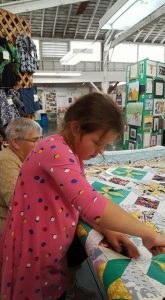 Blair adds her stitches to the Fair quilt. An amazing 4H Champion award winner for woodworking, Richard King’s “dugout” canoe. This lineup includes most of the dairy cow breeds — right to left: red Holstein, Brown Swiss, Holstein, Jersey. Be sure to visit the Master Gardener’s Learning Garden at the Fair. The fragrant sweet peas are in full bloom, and there’s plenty more to enjoy.